Everyday life in American history and today. As I watched Obama ride the train on the route that Abraham Lincoln took to his inauguration it struck me how different were the circumstances of the two rides. I remembered reading about how distraught Mrs. Lincoln was when this happened. Lincoln had many enemies as it was well known he did not support slavery. A plot to assassinate him had been discovered in Baltimore. For fear of assassination they had to slip Lincoln into the capital in secret. You can read about his Secret Train Ride here. How wonderful it was to be able to watch Obama's train ride as he was celebrated at each train stop. Today the crowd watching the inauguration was a wonderful mix of races and cultures. 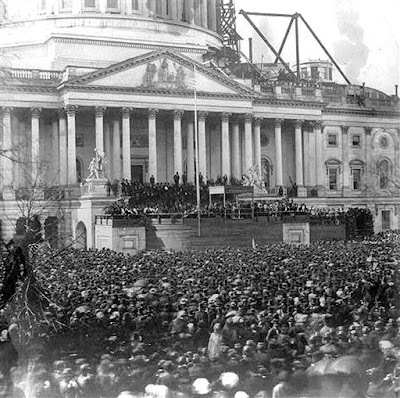 Sometimes we get discouraged with how slow progress can be but looking back to the inauguration of 1861 we see how, through the efforts of so many, our country has truly changed. Note, the U.S. Capitol, was undergoing some construction at the time. Go to my contact page. "For a substantial part of this country's history, quilts were virtually the only means of personal and artistic expression readily available to the average woman." ~Robert Shaw "Quilts a Living Tradition"